Eight-year-old Raymond Botsanzira from Chivhunga Village in Murewa has been bedridden for close to a year after he was attacked by a rabid dog. A visit to the Botsanzira homestead under Chief Mangwende last Friday revealed the struggle his parents have been going through since the attack by a neighbour's dog. Student pastor Ernest Munyaka of the AFM Ephratah Assembly was leading a prayer for Raymond with neighbours when our news crew arrived. Inside his room, Raymond barely moved. He cannot talk though at times he blinks. A tube was fixed through his nose to feed him. "We feed him through this tube and he has been surviving on plumby-nuts since last year. "The doctors wrote us a list of food items Raymond requires, but we cannot afford the foodstuffs, hence we feed him on the plumby-nuts we collect every month from the hospital," said his mother, Charity Chifamba (41), as she wiped off tears with the back of her hand. Chifamba vividly remembers how it all happened. It was on September 17 last year when her fifth born and eldest son Raymond was mauled by a the vicious dog. "Raymond had been sent back home from school over unpaid fees that day. We had not paid the $13 to Rota Primary School where he was doing Grade 1," she said. "We went to the garden to water the vegetables. I then sent him to drive away the cattle that were approaching the garden. "I heard my son screaming and together with other villagers we rushed to the scene only to find the dog 'eating' my boy." Raymond sustained deep wounds from the dog bites on his back, legs and hands. "It was terrible, the dog was tearing him apart but with the help of the villagers we rescued him," she said. "I rushed him to Kadzere Clinic (popularly known as Kwa Rhodes) where he was given an injection before he was referred to Murewa District Hospital where he was admitted." According to the villagers, the dog was later killed with a spear after it had mauled other dogs at another homestead. Chifamba said Raymond was discharged from Murewa Hospital where they were told to buy six injections. However, due to poverty they only secured four of them three weeks later from the social welfare department. "We came back home and he was in pain. We were told to buy six injections each costing $58, but we had no money. We tried to engage the dog owner, but he threatened to kill us," she said. "Raymond got a little bit better and returned to school. We also received assistance from social welfare that paid for four injections. "But it was after the last injection that things got worse. His hands and legs got paralysed." To compound the situation, Chifamba was heavily pregnant with her sixth child. Raymond was taken to Parirenyatwa Hospital by his father Simon Botsanzira (54), who spent more than a month with him in Harare. The boy was given anti rabies vaccines, but nothing changed. "I left the hospital in pain. I was told that my boy was going to survive on plumby-nuts," he said. "The medical officials taught me how to feed Raymond and after one and a half months he was discharged. "He was motionless and I had to carry him on my back until I arrived at the village. "Some Chinese doctors told me that Raymond might get better with time, but I do not know when," added Botsanzira before breaking into tears. According to the Botsanzira family, the dog owner is "untouchable" as he does not turn up for court hearings. "The dog owner is in this village, but he is untouchable. In March we were summoned to court and he did not come,"Chifamba said. "A warrant of arrest was issued, but police at Rhodes cannot do anything. "He is someone influential, I guess. "Some neighbourhood police officers who tried to talk to him ran away after he produced a pistol. We pray that justice will prevail one day." 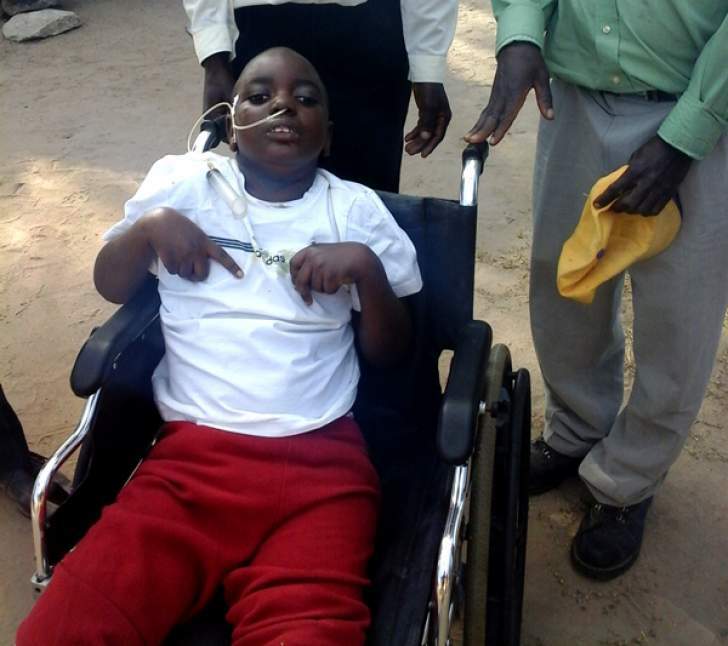 The Joice Mujuru-led People's Rainbow Coalition aspiring candidate for Murewa West constituency, Peter Magaso Gede, donated a wheelchair to Raymond. "I was doing my door-to-door campaigns when I heard of the boy's plight," he said. "I sourced a wheelchair so that he can be taken outside the house to get fresh air. Before that, he was always inside." The Botsanzira family is appealing for assistance from well-wishers to buy potatoes, cucumbers and fruits among other things for Raymond. "We need assistance in every form. I pray that one day my son will become healthy again. "Currently we are in need of the tubes that we use to feed him for they need to be constantly changed. "We have been using the same tube since December, it is not healthy," said Botsanzira, who is a member of the Guta Risina Kutsvagwa apostolic church. Rabies is caused by a virus that affects the central nervous system, particularly causing inflammation in the brain.